Around 800 people have invaded the Uru Eu Wau Wau indigenous territory in the Amazon state of Rondônia. Uru Eu Wau Wau Indian leaders met with Brazilian authorities on Wednesday to demand that they remove the invaders immediately. It is reported that a corrupt local lawyer has been selling land titles in the Indians’ territory. 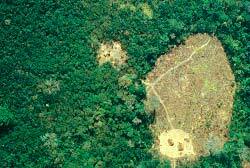 The territory is home to an estimated four to six groups of uncontacted Indians who will be at risk from disease and violence if the invasion is not stopped. After their first contact with outsiders in 1981, the Uru Eu Wau Wau’s population plummeted due to illness introduced by invading colonists and miners. There have been frequent clashes, with fatalities on both sides. The Uru Eu Wau Wau territory was signed into law by the president of Brazil in 1991. 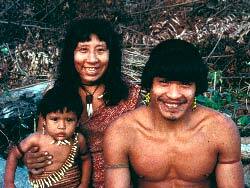 Under Brazilian law only indigenous people may occupy and use the natural resources there. The Uru Eu Wau Wau’s land has been targeted by colonists, ranchers, loggers and miners who poured into the region after a major highway, the BR 364, was paved nearby with World Bank money in the 1980s. Today the Uru Eu Wau Wau number only several hundred and, because of their relatively isolated state, are still very vulnerable to disease. They use a tree bark to make tikiuba, a poison which they put on their arrow tips to hunt tapir and other large animals. They are famous for tattooing around their mouths with genipapo, a black dye made from an Amazonian fruit.